Spring semester classes don't start up until January 26, so there's plenty of time left for Hofstra students to enjoy winter break! A few Pride Guides have had some neat travel opportunities that we'll just mention here -- they'll share their experience on the blog in the coming weeks! 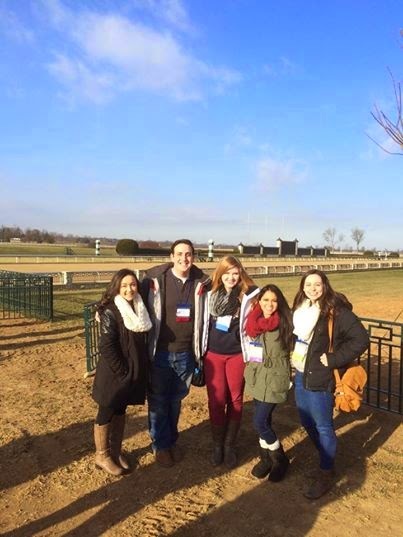 Pride Guides Jane, Jordyn, Cristina and Melanie joined Hofstra's campus visit coordinator Andrew in Kentucky this week for a campus tour conference. They stopped by Keeneland Race Course, where the above photo was taken. Judging by the clear blue sky and smiling faces, they're not missing the snowy weather we're currently having here! Another interesting travel mention from this winter break is the Hofstra in Belize program. Pride Guide Julissa is currently on the trip and we look forward to hearing about her travels soon! Check out the program's blog for updates from their adventures in snorkeling, exploring Mayan ruins and more. Did you travel at all during the break? Yeah, i've traveling in Indonesia, you can check on my blogpost. I've visited first indonesian president grave and another place in same city. Maybe you interest to travel abroad into indonesia?